조선시대 무신인 오자치를 그린 것으로 추정되는 초상화로 가로 105㎝, 세로 160㎝이다. 오자치에 관해서는 알려진 것이 거의 없으나, 세조 13년(1467) 이시애의 난을 물리친 공을 인정받아 일등공신에 올랐다고 한다. 이 초상화는 오른쪽을 바라보고 의자에 앉아있는 모습이다. 머리에는 검은색의 사모를 쓰고 짙푸른색의 관복을 입었으며 두 손은 옷 속으로 마주 잡고 있다. 가슴에는 호랑이무늬를 수놓은 흉배가 있어 이 그림을 그릴 당시 그의 직위가 무관1품이었음을 짐작할 수 있다. 얼굴은 살색을 칠한 후 갈색으로 윤곽을 그렸고 입술은 살빛보다 약간 짙은 황토색을 사용하여 차분한 느낌을 준다. 옷의 외곽선을 각이 지게 표현했고 옷자락의 옆트임 안쪽으로 보이는 안감도 풀을 먹인 것처럼 세차게 표현되었다. 이 그림은 그린 대상만 다를 뿐 장말손의 초상화나 손소의 초상화와 같은 형식과 형태를 보여주고 있어 성종 7년(1476) 모든 공신의 영정을 그리도록 했을 때 함께 그려진 것으로 보인다. 조선 초 몇점 남지않은 귀중한 작품으로 공신그림의 전형적인 모습을 보여주고 있다. 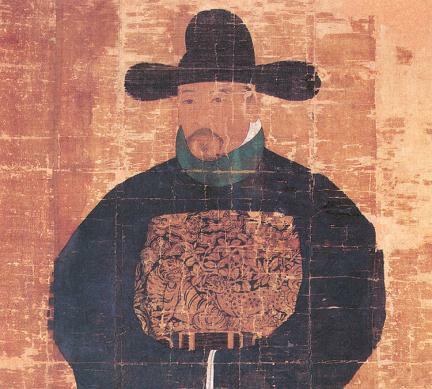 This portrait is assumed to be that of O Ja-chi, who was a military official during the Joseon Dynasty. It measures 105 cm wide and 160 cm long. O Ja-chi is very little known but was designated as first-rank meritorious subject in recognition of his military merits, having suppressed a revolt led by Yi Si-ae in the 13th year of the reign of King Sejo (1467) of the Joseon Dynasty. In this full-body portrait, he is sitting on the chair, looking to the right. He is wearing a black official hat and a deep blue official robe, holding both hands together in the sleeves. The rank badge on the chest, which is embroidered in a tiger pattern, suggests that he was probably the highest-ranking general at the time when the portrait was drawn. The face is painted with natural skin color, with brown color used to define the facial contour. The lips are painted with red clay color that is a little darker than the skin color, giving a subdued feel. The outline of the robe is depicted with straight lines. The lining as seen through the side slits of the robes looks very rough, like starched clothes. 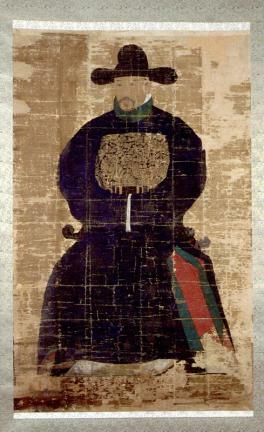 This portrait shows great similarity with the portraits of Jang Mal-son and Son So in terms of form and style, so it was probably painted at the same time as the portraits of other meritorious subjects at the King’s order in the 7th year of the reign of King Seongjong (1476) of the Joseon Dynasty. As one of a few very valuable existing portraits of the early Joseon Dynasty, it shows the typical style of the portraits of meritorious subjects.